Everyone has an opinion. It used to be that people would share their opinions with their friends, family and neighbors — sometimes even with the person or company that the opinion was about. Nowadays, the entire world is the potential audience for someone’s rave or scathing review. The Internet has revolutionized many things, including how people research and express their opinions. There are review websites for everything — from doctors to hot tubs. So how can you find out what people are saying about your company, and what can you do about it? Yelp is one of the most popular review sites that people use today. Yelp allows people to review local businesses, large and small, based on a five-star rating system. Reviewers can rate, comment and even post photos. Businesses can claim their listing on Yelp for free, which allows the business to manage information such as photos, website address, business hours and phone numbers. Free tools allow a business to respond to a customer with a public or private message. Yelp also sells advertising, which allows a business to show up more prominently when users are searching for a particular service, as well as show up on a competitor’s page (unless it also advertises with Yelp). If nothing else, your business should claim their Yelp listing, monitor the overall score, and evaluate the reviews for any potentially useful information. Don’t worry about being flawless: the general public expects to have some negative reviews on any given service or product — it makes the reviews more believable. However, if there is an overall negative trend, you may consider a strategic plan to change course. Normally, this would involve an internal and external component. Internally, your business should address any factors that may negatively influence customers, such as customer service, inventory management, customer retention, and so on. Externally, your business should consider a long-term strategy to ask your customers for reviews. 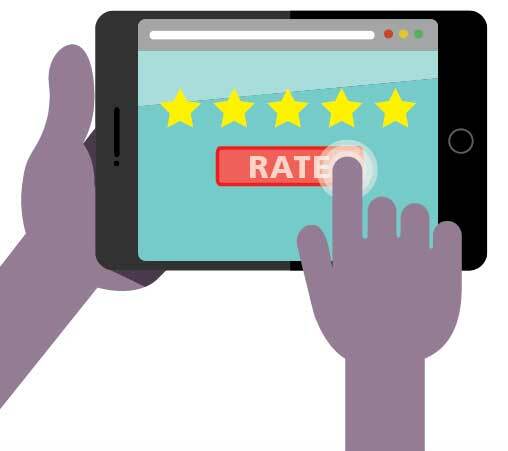 Most folks only review when they have had a somewhat negative experience or an exceptionally good experience, so reminding happy customers to give you a review can make a big difference in your business’s overall review score. Another large and growing website that people can research businesses and posts reviews is Google. In part one of this series, I explained how to claim your listing on Google My Business. If you have done this, your business now has a Google+ page. Google pulls information from your page to display when someone searches for your company, including reviews. In a fairly standard Google search, a person would see the company website, a map with the business location(s), and the associated Google listings, which include the overall review score and a link to your Google+ page. Organic search results and related searches appear a little farther down. Because the review rating is so prominently displayed when people are searching for your business on Google, it is imperative for your company to claim its Google page and monitor the reviews and information on that page. If necessary, the same steps can be taken as mentioned in the Yelp section to try to mitigate a less-than-ideal score. Your business could be receiving reviews on several other sites, including Facebook, TripAdvisor and Foursquare. With Facebook, you can enable ratings on your Local Business page, which means you can (partially) control what score shows. With TripAdvisor and Foursquare, you can only control your business’s basic information by claiming your listing and responding to reviews. But with so many sites that have reviews, can you possibly claim and manage them all? Probably not. Managing one or two of the major sites should not take much time at all. The key is to monitor your business’s results in the main search engines to see where your business is showing up and what ratings your business has. If there are a lot of negative or so-so reviews, consider taking steps to boost your products and customer service. Responsive service, a high-quality product, and a solid customer retention plan can elevate your company’s Internet rating. Keep in mind it’s a long-term strategy. You need patience. In next month’s article, we will be exploring the final part of this series — the ever-changing world of social media. In the meantime, I encourage you to conduct a few Internet searches for your business — and your competitors — and see what you find.